The path to success in a law firm or law department has changed, yet many continue to rely on outdated metrics to track performance. Both buyers (law departments) and sellers (law firms) rely on billable hours as a proxy for productivity and value. This is silly. Sure, hours are a unit of production and law firm leaders should be aware of what it costs to produce the output of legal work. And yes, law department leaders should be aware of what they're purchasing. But if I visit the grocery store with a list of 47 specific items, I don't necessarily declare victory if I return home with 45 or 35 items, or 47 completely different items that cost less. I've also written previously about the lazy reliance on benchmarks -- relying on dissimilar metrics from dissimilar organizations in dissimilar markets with dissimilar characteristics is a recipe for mediocrity. A general counsel declaring that "We should reduce legal spend to 1.3% of revenues just like our competitors in the same SIC code" is as short-sighted as a managing partner stating that "We need to reduce our secretarial ratio to 4:1 to keep pace with more nimble competitors." There are a hundred factors in play that should be considered. Perhaps an investment in the legal department can improve organizational throughput, e.g., reduce the time negotiating contracts, accelerated IP review increasing our speed to market, so cutting funding harms the business. Perhaps a practice that derives profits from lower-cost paralegals and secretaries managing large piles of filing will come to a screeching halt when this work is pushed up to associates and junior partners, simultaneously eliminating the benefits of leverage and annoying clients who have come to expect lower rates. My friend Silvia Hodges Silverstein, founder of the Buying Legal Council invited me to participate in recent conferences in London and Chicago, where rooms full of legal procurement professionals, in-house counsel, and law firm lawyers and professionals discussed the evolving world of legal metrics so we can find common ground in measuring and delivering value. For the Chicago session, I recorded my remarks, and you can view the session below. 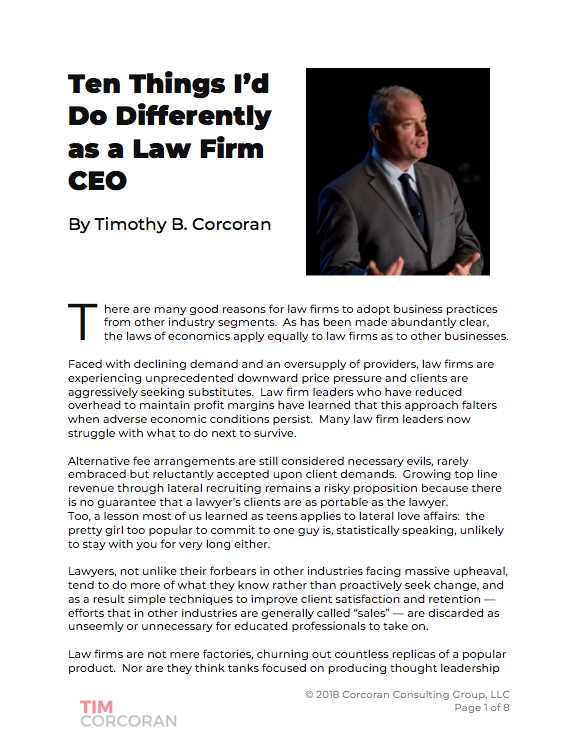 My friend Greg Lambert, a leading information professional and co-founder of the award-winning 3 Geeks and a Law Blog, then riffed on my session to focus on metrics for a sub-set of professionals within law firms. After you view the video, you should read Greg's article. How can you incorporate better metrics in your organization?